Here is Clayton Klein at his best. Challenge the Wilderness is a powerful historical adventure that sweeps across Canada from Ontario to Labrador. George Elson was the noted guide of the ill-fated Leonidas Hubbard Expedition into Labrador in 1903. Then two years later he successfully guided Mina Benson Hubbard across the Labrador peninsula from North West River to Ungava Bay. Other than these two journeys very little was formerly known of Mr. Elson outside of Moosonee and Moose Factory. Learn the Unique way of life of the James Bay Crees during the early years of the twentieth century. 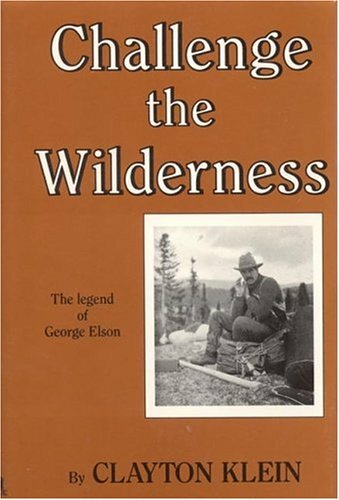 Challenge the Wilderness is a historical novel of the loves and tragedies in the adventure-filled life of the legendary George Elson. The authors not only present a well written history of an ill conceived adventure;they actually "re-created" each harrowing step, mile after mile canoeing and portaging over the same route. In a manner of speaking it is a well written "first hand" account of a tragic mis-adventure from a century past. Well worth reading and always relevant to those who enjoy the wilder places in the north. I am an adventure traveler and canoeist, and an avid reader of adventure writing.There are a number of books that purport to tell the story of the ill-prepared Labrador Adventure, but it was told best, last and forever in the book, "Great Heart:The History of a Labrador Adventure. "It is written by experienced canoeists and guides James West Davidson and John Rugge.These talented authors create atmosphere, characterization and drama that is unforgettable.I have returned to the book many times.Every canoeist, from novice to expert, should also own their other book, The Complete Wilderness Paddler.The authors use the story of a wild and wooly trip down the Class IV-V Moisie River in Canada as a way to teach everything from how to plan a trip to how to survive the torture of black flies.It is hilarious, brilliant, insightful, genius!You can read it over and over and learn new things about canoe camping.Even if you'd never set a paddle in a river, you'll love the graceful writing of Davidson and Rugge. This is a great read. There is little written about this turn of the century, "last frontier" of North America where even today natives will tell you that you can't get there from here. The grueling hardship and trajedy are well portrayed - as are the portraits of each individual. It truly takes the 3 books written about this seminal journey and adds information from the diaries and other writings of the various figures involved; and, this is artfully done by shifting voices. The book flows well and holds suspense to a surprising degree even to those who know the eventual outcome. 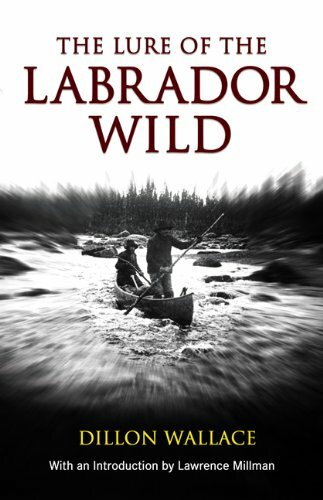 This book tells the story of two expeditions across Labrador. The first took place in 1903 by three men, on which one of them, Leonidas Hubbard, died. Three years later, his wife, Mina, made the same journey successfully. These accounts are well written and make good use of the original journals. The Labrador interior has long held the well-deserved reputation of being one of the most inhospitable places on earth. It is a patchwork of Canadian Shield granites and sphagnum moss, labyrinthine caribou trails and desolate subarctic barrens, all set against glacier-scoured hills stretching to an apparently limitless horizon. In the late spring of 1903, Leonidas Hubbard, a young writer, and Dillon Wallace, a forty-year-old New York attorney, set off with George Elson, a native guide with no firsthand knowledge of their destination, to explore the incompletely mapped Lake Michikamau region of interior Labrador. Beset by delays, the men paddle past their intended route, the Naskaupi River, and head up the horrible Susan River instead. When in early September they finally glimpse the vast waters of Michikamau from the top of an unknown mountain, Labrador's cold winds had begun. With scant scraps of food remaining, the three begin a desperate struggle against starvation and the rapidly approaching and unforgiving winter as they race home for their lives. I am an adventure traveler and canoeist, and an avid reader of adventure writing.This story was told best, last and forever in the book, "Great Heart:The History of a Labrador Adventure. 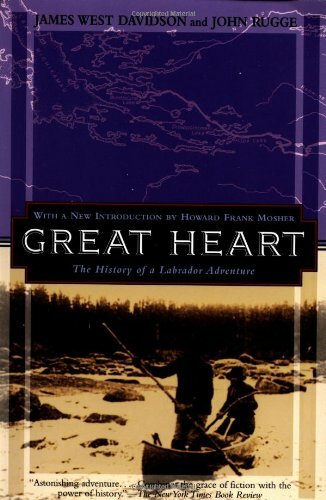 "It is written by experienced canoeists and guides James West Davidson and John Rugge.These talented authors create atmosphere, characterization and drama that is unforgettable.I have returned to the book many times.If the story of the Labrador adventure intrigues you, I implore you to read "Great Heart." Every canoeist, from novice to expert, should also own their other book, "The Complete Wilderness Paddler. "The authors use the story of a wild and wooly trip down the Class IV-V Moisie River in Canada as a way to teach everything from how to plan a trip to how to survive the torture of black flies.It is hilarious, brilliant, insightful, genius!You can read it over and over and learn new things about canoe camping.Even if you'd never set a paddle in a river, you'll love the graceful writing of Davidson and Rugge. Where the heck are they? A wonderful book, very readable and absorbing.The strength and courage of these three men is inspiring and can only be imagined.E.g., making a 40 mile portage, half starving, carrying a canoe and several hundred pounds of supplies and equipment, or having to wade across a river (up to their armpits) that was encrusted with ice along its banks and having their now-wet clothes start to freeze on their bodies while they try to build a fire.However, the 3-star rating is not because of the writing or the adventure:this version (Lyon Press, 2004) has no maps and no photos.Photos would have added another dimension to understanding the spartan hardships of such an adventure, not to mention conveying the author's meanings of barren, difficult, or heart-breaking - all of which I thought were understated.And oddly enough, these photos are readily available - a google search will locate many, and the Canadian Virtual Museum has 67.The photos along with the text would have added substantial impact to the question, "How could they have endured this?" But the lack of a map is intolerable.Maps are referenced half a dozen times by Wallace in the first half a dozen pages: their inaccuracies, their incompleteness, and the details his map now provides.Since a major navigational failing of the expedition is due to an inaccurate map from the Canadian Geological Survey (circa 1896 - and also available online via the CGS website), its absence is unforgivable.Another CGS map that got Hubbard so excited because "Unexplored Territory" was written across northern Labrador is another "must have" exhibit.Without a map, the reader has no idea where these men started, where they wanted to go, where they got lost or how they returned, or can understand the sad realization that a dream predicted an accurate route to safety but was ignored. I spent more time online looking up maps of Labrador, trying to find the various missteps of the explorers (e.g., the Nascaupee, Susan, and Beaver Rivers) than I did reading the book.If you don't want to get lost reading this incredible adventure, then buy a version of this book that contains maps.I found this version of the book very frustrating. I couldn't put this book down once I started and really enjoyed the read. It has a place on my shelf of classics and just a very real story that is captured extremely well in words. I'm ordering a second copy to give to my fellow canoers who head for the boundary waters canoe area wilderness. We travel with up to date equipment and maps. The fellows in this book "winged" it with what was then state-of-the-art gear. This book is a great contrast between wilderness canoe travel from this century to the last century. The account is truly chilling at times. You are tempted to exclaim "these guys must have been nuts!!" But their journey was truly an adventure. Few of us would have the stones to attempt this today. If you do any form of wilderness trekking or canoeing, you will really like this book.